Villefort to Les Vans was my last day in the Cevennes National Park, and while the park was amazing I was looking for a change. I had enough days of camping in a row, and I needed a break from the cold, rainy and windy weather. After following the GR6/7 and their variants (60/66/68/70/71/72) through most of the park and the GR44 into Villefort, the path picked up the GR4. 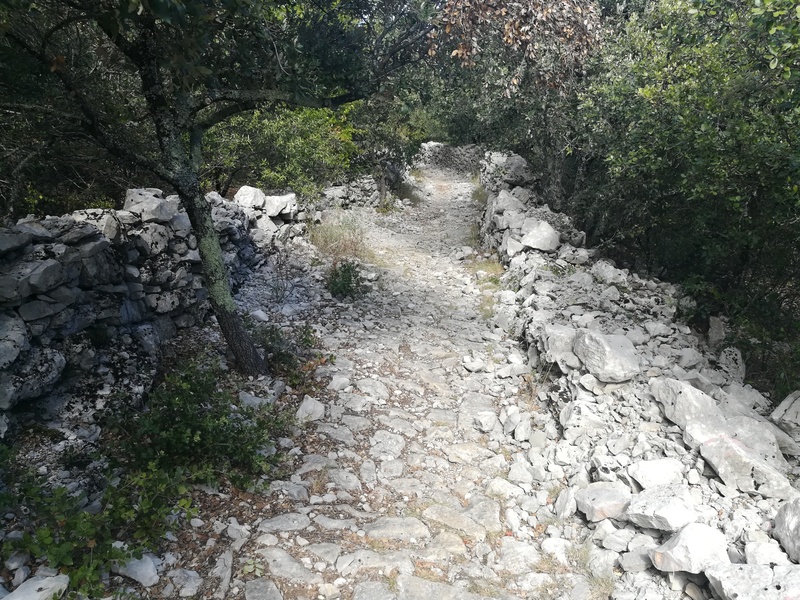 There was one last steep and high ridge leading from Villefort out to the south of Les Vans, and the path took full advantage. There was a gradual climb through forests to dirt roads and trails on top of the ridge. There were some pretty amazing views out over the forested mountains and the river valleys, and I was able to see all the way to the Alps. On one of the roads I was passed by a van with a group of people inside. 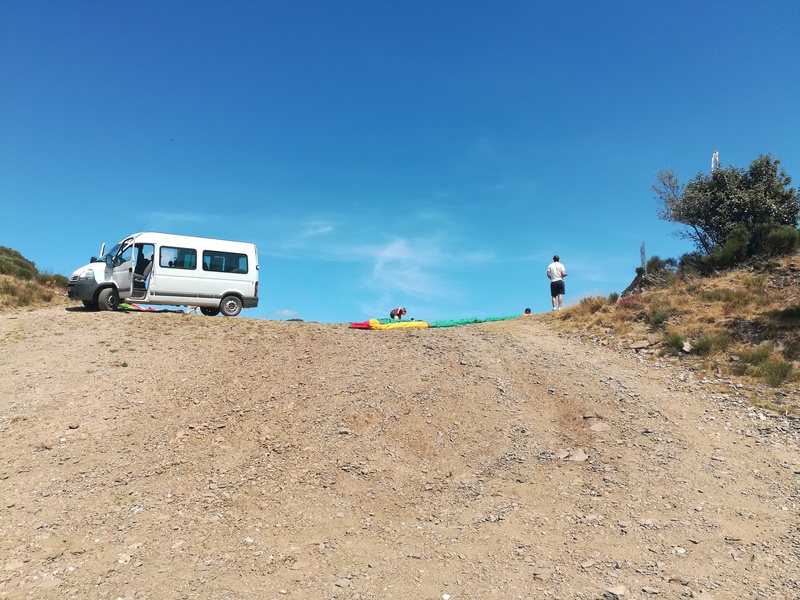 Once I reached the highest point of the ridge, I saw the group unloading paragliding equipment, and they were airborne by the time I reached the fire tower and communications array at the end of the ridge line. It was a steady and rocky drop down from the ridge, which felt a bit slow and rough since it was near the end of the walk for the day. Once the path reached the hamlet of Brahic it leveled out a bit, but was still very rocky. The trail was flanked by white rock walls, which seemed like a channel for keeping all of the rocky madness from escaping the width of the trail. A final drop took me down into Les Vans, the largest village I had been through since before entering the Cevennes National Park. Les Vans was very lively, with a few tourists, but mostly locals out socializing or playing petanque. It was quite nice there on a warm evening. 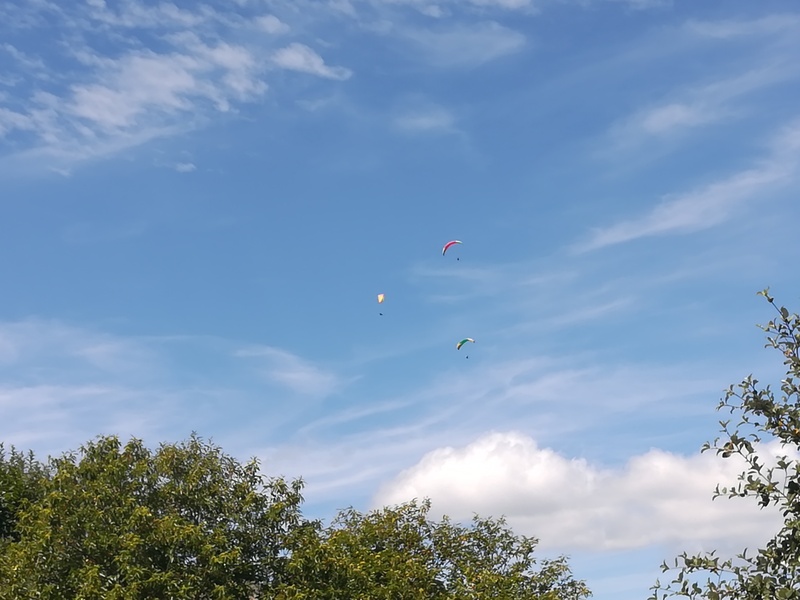 The next day was very warm with little breeze. After traversing some areas near cliffs, the path crossed a large agricultural valley where grapes and other fruits and vegetables were grown. I stopped at a roadside fruit and vegetable stand for a break after being in exposed area for some time. I talked briefly with a guy that had ridden his touring bike from Stockholm. Most of the afternoon was not that great. It was mainly dirt roads through the hills with very limited scenery, and those roads got a bit old after several hours. A change in scenery didn’t come until I was just outside of Salavas and Vallon Pont d’Arc, where I started to see tourists that were gathering at the river. After crossing the Ardeche river, it was a short walk up the hill to the very busy village of Vallon Pont d’Arc. There were lots of river-going tourists here, and the village seemed to explode with people around dinner time. It was a beautiful village, but the dinner time crowd got to be a bit much as it was hard to find a table anywhere. After leaving Vallon Pont d’Arc and going through Salavas, it turned into a odd day where the way was not very nice, but the villages along the route were great. Almost the entire day was spent on dirt roads in low forest in hot and dry conditions. I would venture to say that most of the day was quite boring, and it made the day feel much longer than it was. 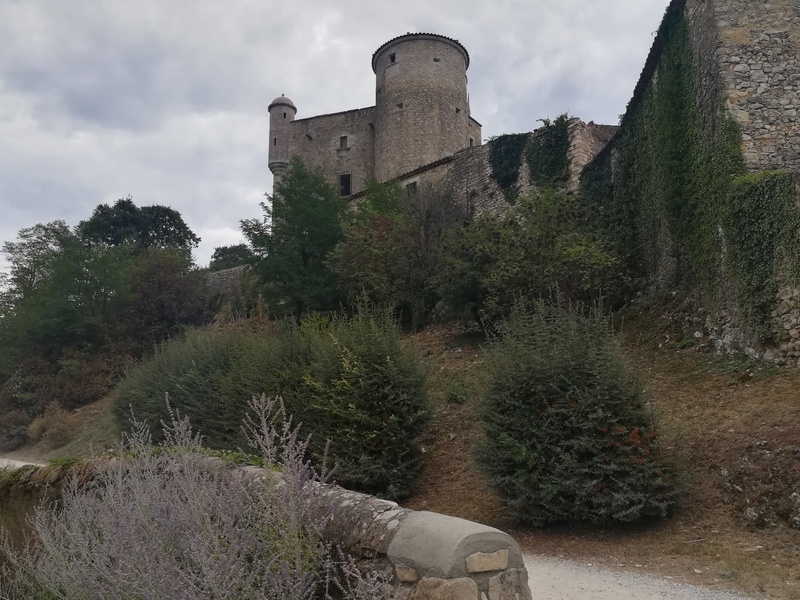 The village of Labastide de Virac with its nice castle was a good break from the monotony. I walked around the castle a village before continuing on. The afternoon was very long and had more of the same dry, rocky dirt roads with no sights. That blandness was finally shattered when I hit the last kilometer into Aigueze. The trail crested a small rock outcrop that was on the edge of the cliff overlooking the river. From here you could see all of the people in the river, as well as Aigueze teetering on the edge. 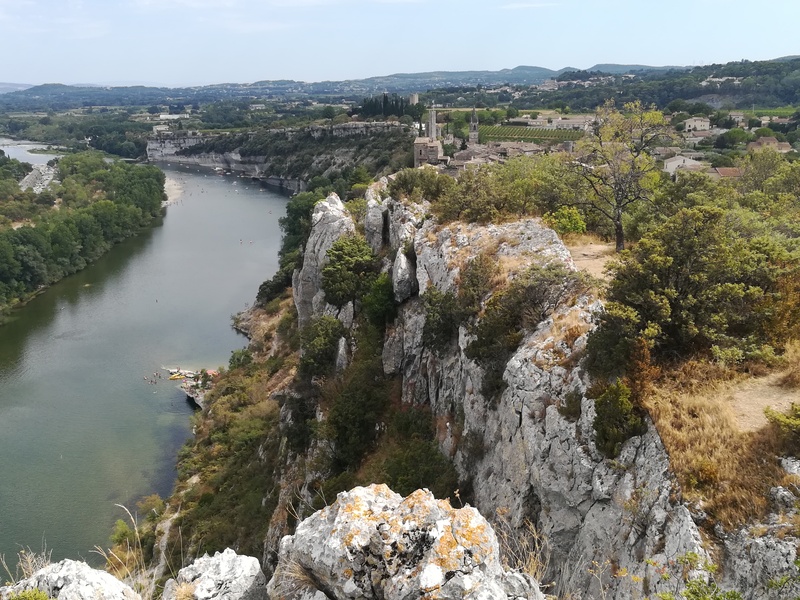 There were also views across the river to Saint Martin d’Ardeche. It was quite spectacular. Aigueze was outstanding. Wonderful buildings, a castle and church all sitting on the cliff wall. Town was busy with tourists and petanque players. 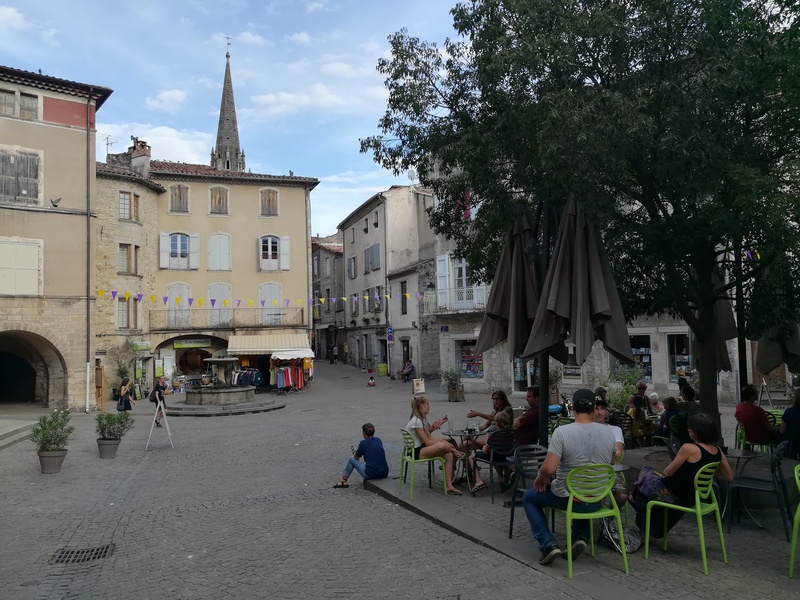 They had a whole section of the main square area cordoned off for a petanque tournament, which added a buzz to the ambiance of the village. 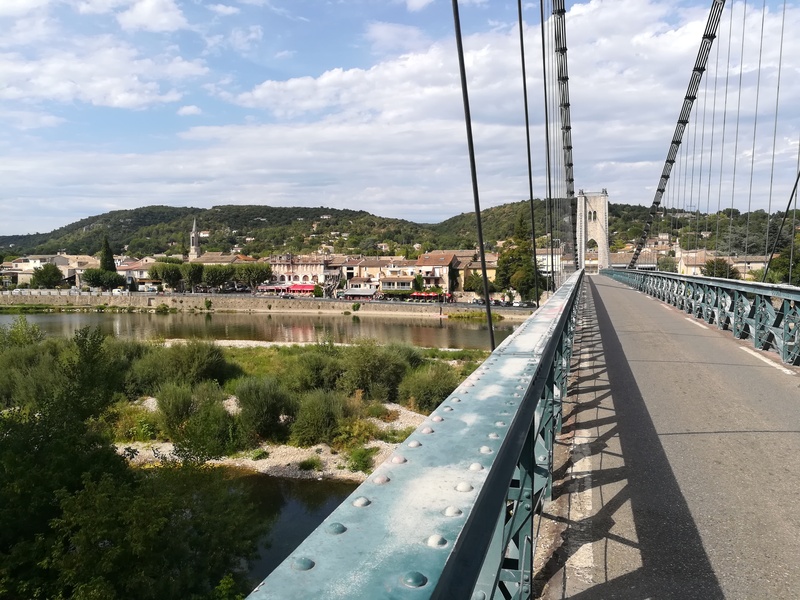 After enjoying Aigueze for a while, I proceeded to cross the suspension bridge into Saint Martin d’Ardeche. This was a bit tricky as the bridge was barely wide enough for normal cars, and traffic was alternated to allow for two-way traffic. 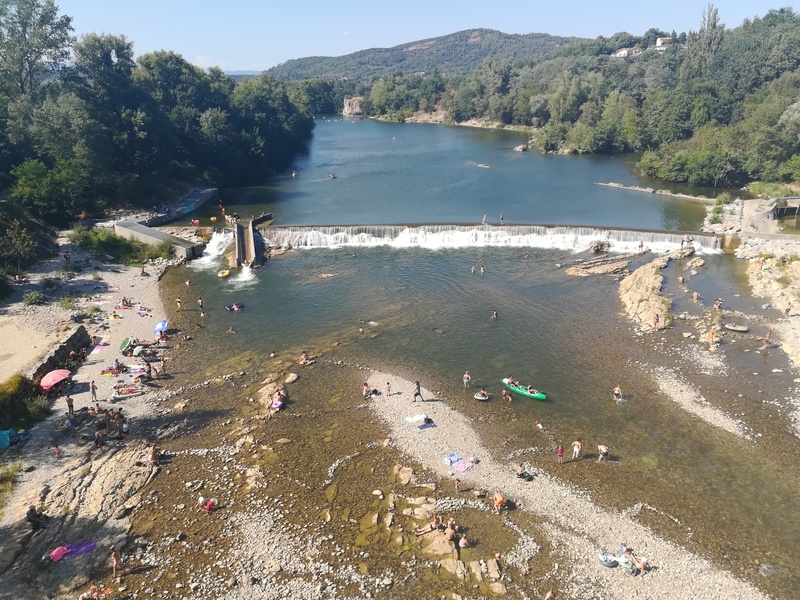 While less dramatic than Aigueze, Saint Martin d’Ardeche was very nice and had a good atmosphere once the river crowd decided to dry off for the evening. The area with these two villages on the river is definitely special, and it’s easy to see why it is a warm summer vacation spot.